My friend Professor Jacobson cites a New York Times report that purports to reveal to the world that the eleven Israeli athletes and coaches who were murdered at the Munich Olympics in 1972 were tortured, and in at least one case, castrated. Ilana Romano and Ankie Spitzer, whose husbands were among the Israeli athletes held hostage and killed by Palestinian terrorists at the 1972 Olympics in Munich, rejected that request, too. They looked at the pictures that for decades they had been told did not exist, and then agreed never to discuss them publicly…. In fact, readers of this blog might recall that Ilana Romano has revealed even more gruesome details on a previous occasion. 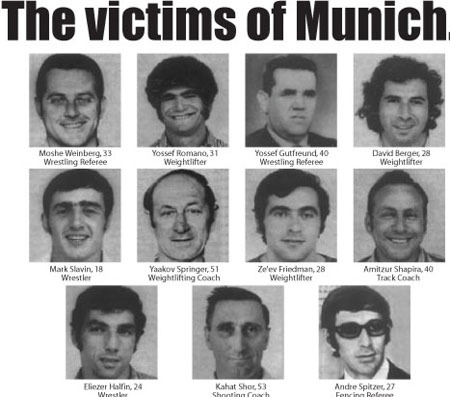 Guri Weinberg, the son of murdered Israeli wrestling coach Moshe Weinberg, on why the International Olympic Committee will never honor the 11 Israelis who were murdered at the Munich games 40 years ago. In 1996, I, along with other Munich orphans and three of the widows, were invited for the first time to the Olympic Games in Atlanta. Before the Opening Ceremony, we met with Alex Gilady. Gilady has been a member of the IOC's Radio and Television Commission since 1984 and has been the senior vice president of NBC Sports since 1996. My mother said, "But no Palestinian athletes died." Gilady responded, "Well, there were Palestinians who died at the 1972 Olympics." I heard one of the widows say to Gilady, "Are you equating the murder of my husband to the terrorists that killed him?" Then Ilana Romano burst out with a cry that has haunted me to this day. She screamed at Gilady, "How DARE you! You KNOW what they did to my husband! They let him lay there for hours, dying slowly, and then finished him off by castrating him and shoving it in his mouth, ALEX!" Read the whole thing. It's disgusting. The images of the Westgate mall terror attack in Nairobi, Kenya, are simply horrific. Just last week, Palestinian Media Watch showed a terrorist from the 'moderate' Fatah terror group eating a live snake on television. Islam is a sick religion. It teaches its adherents extreme cruelty to all who are not a part of it. The world would be a better place without it. Not according to Steve Spielberg and Tony Kutchner. Their magnum opus "Munich" told us they were gentle misunderstood family men. In reply to the Empress- one more reason I don't watch movies...with the exception of Robert Duvall's work. Islam is evil at its core. Something so deformed can never be "reformed". It's not just the intensely and regressively tribal nature of their culture. The poisoning of individuals starts at the very beginning of life when even infants aren't safe from sexual abuse - i.e., the only rule is you can't "damage" the baby or you'll have to pay a fine to the parents. Contrast and compare: (1) Saudi Arabia's immense wealth and what do they have to show for it? A theocracy so destructive it wants to tear down even its own shrines; (2) Israel: a "Mecca" for innovative, industrious and creative people who make the desert bloom even while facing the prospect of destruction and annihilation. And be sure to compare the family structures, too. That's where the real evil is perpetuated anew with the deeply sad deformation of each new generation. But what can one expect of a pseudo-religion? Islam is a dystopian, supremacist political-juridical system, indistinguishable from Communism except for the 'god' tacked onto it. If these demons managed to conquer the world they would turn around and begin destroying one another as the various sects began their even more vicious internecine warfare. I don't pretend to know the mind of G_d, but I do know that Islam will eventually implode of its own evil. Were it not for the spread of Communism/socialism w/ its deliberate spread of political correctness, Islam would have been gone by now. Instead, 19 Saudi killers brought down Twin Towers, damaged the Pentagon, and killed thousands of people. What do our fearless leaders do? Declare war on 'extremism'. And now we have the neighbors of those terrorists in San Bernardino claiming they were worried about that couple who went on a terrorist rampage. "Worried" but they kept silent. Why? Because they were even more worried about being called racists. We learned many years ago that being called "waaaycists" is our badge of honor. Does it 'marginalize' us? Yep. But that's where real change happens: at the margins. That's why I smile every time I see the Baron's button, made at the very beginning of this walk through the Valley of the Shadow of Death. Perhaps you've seen it? The one that says "I'm a fan of disproportionate response"? When the B had to stop painting landscapes after 25 years, I was worried he'd find no other creative outlet. Since I was so sure he was meant to be here creating images, I wondered what G_d had in mind...I shouldn't have worried.